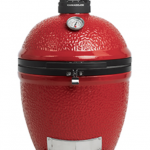 Designed to fit the large or 18″ diameter ceramic grill/smokers. 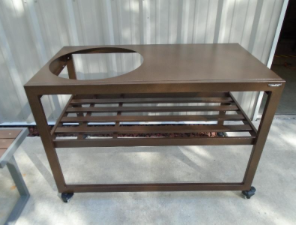 Quick and convenient is how a lot of people like to grill, and this is the grill cart for them. Built to hold the grill with just enough storage to get the job done to everyone’s delight. It’s extremely portable, but makes a fine addition to any patio that’ll last a lifetime. The Challenger Spark cart is sold in 1 standard size. 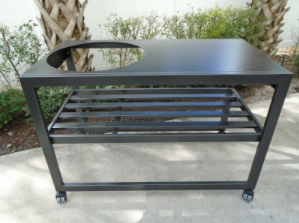 It is priced with a bottom shelf or with only the top shelf and a grill support under the grill as pictured. The bottom shelf mounts on the lowest point of the 4 legs providing a third level. Available in two colors, please call 706-722-3939 Monday through Friday 10am – 6pm EST or Saturday 10am -3pm EST. If you prefer you may email sales@firesideoutdoorkitchens.com.